Personalised Pet Tags Australian Made - from $9.95, $12.50 & $14.95 each! Customised Pet Tags - from $9.95, $12.50 & $14.95 each! Above tags are for illustrative purposes only. Actual tag size is 38mm x 26mm. ATTENTION: PetTagman currently are on leave! would like to offer you a 10% discount on your order to show our appreciation for your patience. Just enter the following code into the promo box in the checkout and you order will be discounted. We look forward in fulfilling your order! This bone shape tag is Australian Made stainless steel and can fit 3 lines of 10 characters per line including spaces. Maximum dimensions are 38mm x 26mm. This disc shape tag is Australian Made stainless steel and can fit 4 lines of 10 characters per line including spaces. Our recommendation is to only use 3 lines for the best result! Maximum dimensions are 38mm x 32mm. This round shape tag is Australian Made stainless steel and can fit 3 lines of 10 characters per line including spaces. Maximum dimensions are 33mm diameter. This star shape tag is Australian Made stainless steel and can fit 10 characters per line including spaces on lines 1-3 and 8 characters including spaces on line 4. Our recommendation is to only use 3 lines for the best result! This mini G.I. shape tag is U.S. Made stainless steel and can fit both 3 or 4 lines of 10 characters per line including spaces. Maximum dimensions are 38mm x 22mm. This G.I. shape tag is U.S. Made stainless steel and can fit 5 lines of text with 15 characters per line including spaces. This is more suitable for larger pets. Maximum dimensions are 50mm x 29mm. Thankyou for visiting PetTagMan. 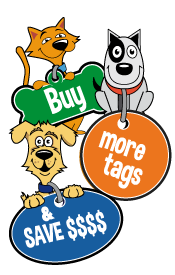 We are an internet business based in Adelaide South Australia, making available personalised identification tags to the general public who need a high quality long lasting product to identify their pets. Our Pet Tags are the quick and simple way of giving piece of mind to pet owners knowing that if the need arises they will be able to be contacted quickly in the case of an emergency. You can click on the below links to see our full range of luggage tags, medic alert tags, outdoor dog tags, and personalised dog tags. View our Pet Names database and add your own Pets details! Just click on 'Belvedere' below! Copyright © 2010-2016 pettagman.com.au. All Rights Reserved.